Hello. My name is Jennifer K. O'Hara. Thank you for taking the time to read about me & my shop, Daintie Designs. Ever since I can remember I have loved to play with paper, glue, & scisssors. I have always made handmade cards and loved to send them or give them to the people I love. I have been called the "card girl" for a really long time. It wasn't until I came down with the disease, IH, Intercranial Hypertention that I made card making more than just a hobby. You can read about my disease at a website my brother is working on at www.jennohara.com. 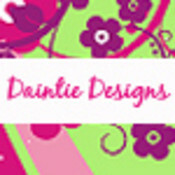 I own 4 shops, but Daintie Designs is my passion. It is where I create with my heart. I love to create. It is an outlet for me that I don't get anywhere else. I have so many projects to work on it is a little ridiculous. I have a studio and it is filled to the brim with craft items. I love it! It is where I feel most at home other than next to my wonderful husband. So please take the time to shop around and come back from time to time as I will always be adding something new. Feel free to contact me for custom orders as well. Thank you for your time. Have a terrific day! DaintieDesigns doesn't have any items in their booth! If you have not yet ordered custom handmade cards or tags from DaintieDesigns…Your missing out..Her products are prettier then Hallmark and her packaging in itself, it’s amazing..She takes every precaution to make your order and your purchase, the best thing you did for yourself! Way to Go Jenn…Great great job! Love this SELLER! Very Well known and Supportive …. Amazing work on this booth Highly Recommended! Now wouldn’t you love to buy QUALITY GREETING CARDS At a lower price? Especially her Cards that are made with LOVE? These CARDS are Better and LOW IN PRICE then the ones at the Store!!! Love yah girl your the BEST!